"Fill" refers to percentage of the above-described volume occupied by the piece. Either select the design, or the percentage fill. For example, crucifixes usually run around 25%, round and oval medals around 75%. Please note: The actual cost will depend upon the size and design of your master item and the current market value of the desired metal; it is subject to our review upon receipt of your model. The per piece cost decreases with the quantity that you order. Following are the material costs used to arrive at the above estimate. You may change these costs, based on the current market, to try to arrive at a more accurate estimate. If you do change them, click Estimate Production Costs again to incorporate the effects. If you have a design of your own creation or an old item not protected by copyright, we can cast it for you in the metal of your choosing. Almost every possible question about this service is answered on this web page. If you have a question that is not answered here, feel free to contact us. The lowest prices -- small item, high quantity, average detail, inexpensive materials -- start around $16 each. If you already know your item's volume (unlikely), that makes this all very easy. But if you don't we can estimate it from the weight and material, or approximate dimensions of your original piece. The more complete and accurate your information, the closer the estimate will be to the actual price. Complete your entries then click [Estimate Production Costs] for a brief analysis. If the results seem way off, then one of your entries is probably incorrect. If everything looks good, click the [Add to Basket] button at the bottom of the form. Complete any other shopping you wish to do, then complete your order via the shopping system. Mail your original piece to us (if we do not already have a mold for it). Once we receive the piece we will match it up with your order and confirm your figures. If our results differ by more than 10%, we will contact you for approval before proceeding. For most production we use the traditional lost wax casting process (but with modern, vacuum-based equipment). This produces excellent results, especially for high counts, detailed pieces, or items with undercuts. Because it involves so many steps, lost wax casting is best for higher piece counts that can be grouped in a batch; whenever possible, we do this. For smaller counts that do not require the highest detail, have no undercuts and start with a metal master, the mold making step can be skipped and each piece directly hand cast in specialized compressive clay. 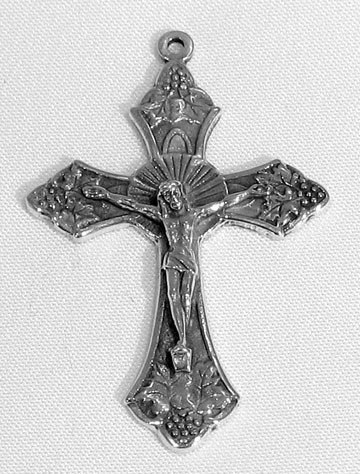 This is well suited for flat, low-relief items like medals, rosary centers, simple crucifixes and crosses, etc., and larger items that cannot be batch cast easily using conventional lost wax casting equipment. This is actually the method (and material) used by museums when replicating larger objects. In cases where either process is suitable we use the one that costs less given the parameters of your order. Sometimes people just want a quick estimate. Other times they want complete details and an education about what we do, how it is done, and what all of the considerations are. The remainder of this page is for the a latter. Quality lost wax casting is a labor- and equipment-intensive process. But it produces the best quality items, and allows several items to be cast simultaneously. Make a vulcanized rubber or RTV mold of the original piece (~2 hours). Inject wax into the mold, creating a wax pattern of the original. Connect the wax patterns to a main sprue. Encase the resulting wax tree in silica clay investment and let clay set (~2+ hours). Steam the wax out of the investment (~1 hour). Heat the investment to about 1400 degrees (~14 hours). Melt the metal and pour it into the clay investment while under a vacuum (~1/2 hour). Allow to cool, and break metal tree out of clay (~45 minutes). Clean the clay from the metal (~15 minutes). Cut metal pieces off of tree. Blend sprue points into pieces by hand. Put pieces through batch polishing processes (~15 hours). Hand finish, polish and inspect the final pieces. Sand casting can get great results, too. But it generally can't handle anything with undercuts and the detail is not as fine as lost wax casting. In addition, each piece must be set up and cast individually. For small counts, though, it is usually a better choice. Make a sand mold for the piece. Melt and pour the metal. Let cure for a few minutes and remove from the clay. Remove and blend in the sprue points. Proceed through polishing and finishing either by hand or machine processes. Some low temperature metals -- pewter and the like -- can be cast directly in rubber molds either under a vacuum or a centrifugal machine. We aren't set up for that process at this time, and don't use our molds that way because it significantly reduces their longevity. The common units of weight/mass are ozs, ozt, dwt and g. ozs stands for ounces (16 per pound). ozt stands for troy ounce (12 per pound). dwt is pennyweight (20 per ozt). And g is gram. dwt and ozt are the most common in the Western/European casting world, with metric grams a close second. Whenever you hear about a metal costing so much per ounce, it is almost always per troy ounce. This is only an estimate (and a computer-generated one at that), not a commitment or binding quote. Upon receiving your master item we will make a personalized determination as to the best/required process and costs. These depend on the actual details of your item, the current market price of the metal you select, and other factors. Most of the time we can stay with or close to the original, web site generated estimate, but we will contact you before beginning if the actual cost will differ from this estimate by more than 10%. There is a minimum custom casting order of $100. For smaller orders please select from our stock inventory. Also, there is a non-refundable $15 fee to handle any item sent to us; this covers the administration, research, precise quote generation, and shipping back to you. If you proceed with a production order, that fee is waived. The produced items cannot look any better than the master item you provide. Some flaws are actually made more evident by the production process. All items are produced in the order in which they are received and paid for, and production times are subject to availability of raw materials and shop equipment. Production times start at about 2 weeks and can be as long as 8 weeks, depending on the particular project. Our equipment constrains the size of the items we can produce. The item cannot be larger than 7cm x 5cm x 1.5cm. Larger items can be cast, but require a different and more expensive process. Items smaller than 1 x 1 x 1 cm may incur an additional charge due to handling difficulties inherent with producing very small items. If the item you provide is your own original creation, then it is automatically protected by copyright and we agree to produce the item only and exclusively for you (unless you expressly tell us we may do otherwise). We will not knowingly reproduce copyrighted items without authorization from the copyright holder. If your item is more than 50 years old, you designed it yourself, or it is available from multiple sources, then it is probably fine. Non-copyrighted items may be added to our general inventory at our discretion (which will make them less expensive and easier to purchase in the future). An "undercut" is an interior open space; we have examples, below, of items with and without undercuts. Most medals and centers, and many crucifixes, do not have undercuts. But some do. An item without undercuts can be easily produced by stamping and sand casting methods. Items with undercuts, high detail, or produced from handcarved wax originals require a rubber production mold and lost wax casting methods. This "Papal" crucifix is an example of something that has undercuts, or open spaces in its interior. This can be produced as one piece only by casting methods and requires a rubber production mold. This "Traditional" crucifix is an example of something that has little or no undercuts. It can be produced by sand casting, lost wax casting or die stamping. All molds remain the property of The Rosary Shop and are stored here. Paying for the creation of a mold does not transfer mold ownership to you; that is merely covering the setup costs necessary to produce your pieces. The advantage to you is that, when you reorder, there won't be another mold fee to pay because we'll already have it on hand. Most molds can produce 500 or more pieces before wearing out, but this depends on the complexity of the piece and the quality of the mold. Please insure your shipment to us. We are not responsible for lost or damaged shipments. By "pewter" we mean any pewter-like, white-metal material. There are many different alloys that pass for pewter. Different gold colors like white, rose and green are created by adding other metals to the gold. That is why pure, 24kt gold is only available in yellow. The antique, oxidized appearance of some items, especially silver ones, is a natural result of the hot casting process. It is normally removed by polishing after casting. Many items can be oxidized again, if you wish, by the application of chemicals available at your local jeweler. It can also be removed by soaking in jewelry cleaner and some scrubbing. A little buffing and polishing will brighten it right up. This system attempts to take into account actual production costs, which means that the per piece price decreases automatically as the order quantity increases. A small additional discount is available for orders placed over the web site. We will return your original piece when we ship your order (unless it was wax, in which case it is destroyed during the mold making process). At this time we do not do custom design work for hire, though we may do so in the future. We will not charge you until we receive your original piece and begin work. There are no cancellations once work has begun. We will refund and cancel the order if we believe that the final products are not an accurate representation of the original. If you are dissatisfied with the final product, you may return it for a refund for the value of the metal (this is usually only worth the trouble with gold). Remember, the purpose of this form is to arrive at a good faith estimate that accurately reflects the costs of producing a specific quantity of an object with a certain material, dimensions and volume. Enter your figures as accurately as possible. We provide this estimating/ordering tool so that you can make an informed decision at your convenience, without having to go through a back-and-forth haggling process over days or weeks, or wondering if you got the best deal you could get. It reflects our actual costs of doing business and allows us a modest, 10% profit on the metal only. Everything else is at cost, without any padding. Some people end up with inaccurate estimates by using the dimensions of the original but the wrong fill percentage. A solid rectangular block of metal -- an ingot -- would have a 100% fill percentage. It goes down from there. Weight and material is generally more precise. For example, the average sterling rosary crucifix is about 4dwt in sterling. From that we can develop a very accurate estimate for production purposes. If we go from rough dimensions -- and the average one is about 4cm tall by 3cm wide by 0.25cm thick with 25% fill, we end up with a slightly higher estimated weight and price. The cast items end up being slightly smaller and lighter than the original due to the effects of the rubber mold, wax shrinkage, metal shrinkage during casting, and the polishing steps. This is unavoidable (and not usually noticed unless you have a high precision scale). If your items have flat backs, we can usually do custom engraving, too. It is usually $5 - $10 per piece. Many, many sterling and gold items from our regular inventory are produced using these same methods and equipment. Another method often used is die stamping, in which a machine strikes a metal blank with a hardened die, compressing the metal into the desired shape. However, the die stamping method cannot produce items with undercuts, and it has a different finished appearance from cast items. Platinum requires much higher casting temperatures and different equipment. We do not do platinum casting at this time. Sometimes we receive notes from people who say they received a lower estimate/quote from another company and want us to match it. We generally don't do that. There is a saying in business: "Quality, Speed, Economy -- Pick any Two." Our focus is on producing high quality pieces. A lot of skill, experience and equipment goes into that. We only want to produce items that we can be proud of, not reduce the quality so that we can match someone's low-ball bid. If you seek only the lowest price irrespective of the quality, then there are other companies competing to get your business. But if you seek good quality at honest prices, then we are happy to serve you. For our sterling items we tend to use an alloy known in the trade as Argentium. It resists tarnishing much better than most sterling.